We're proud to partner with the Alamo Drafthouse, NC Museum of History, and the Cape Fear Museum on a FREE screening of Super Mario Bros. in Raleigh, North Carolina on Friday, December 7th! Our very own site founder and webmaster Ryan Hoss will be hosting the event and will afterwards moderate a Q & A panel with cast/crew. Guests to be announced! Production memorabilia from Hoss's personal collection as well as items loaned from the Cape Fear Museum will be on display. We'll also have a film crew to shoot the event for our ongoing documentary project--Trust the Fungus: From Box Office Bob-Omb to Cult Classic! For more information and to secure your FREE tickets, please visit the Eventbrite page and Facebook event page. To celebrate the thinning boundary between worlds, film critic and essayist Witney Seibold has written a new guest editorial that examines Super Mario Bros. as an example of Orphic myth in the tradition of Gulliver's Travels, Alice in Wonderland, and The Wizard of Oz. Fall down the interdimensional gateway and read "Super Mario Bros." and Orpheus to discover how Dinohattan is like the Underworld and why Koopa is like Hades! Oakland! We're partnering with The Museum of Art and Digital Entertainment (The MADE) and night club The UPTOWN for another 25th anniversary screening of Super Mario Bros.! Please join us October 14th in Oakland, California from 5-8PM! The 1980s and '90s were replete with films exploring post-apocalyptic visions of the future, such as Mad Max, Blade Runner, Demolition Man, Tank Girl, and Judge Dredd. The dystopian Dinohattan of Super Mario Bros. likewise dealt with similar ecological themes. Nuclear power advocate Lindsay B. discusses these themes and how they relate to issues of renewable energy and conservation in the real-world in a new, exclusive editorial: "Ecology in Super Mario Bros."
Be sure to check out our other Editorials and remember: Trust the Fungus! UPDATE #2 (11/5/18): The rescheduled date has been set for Friday, December 7th! For more information, click HERE. UPDATE #1 (9/10/18): This screening has been postponed due to Hurricane Florence. It will be rescheduled for later this year, most likely in early December. Please keep checking back for the confirmed date! We're proud to partner with the Alamo Drafthouse, NC Museum of History, and the Cape Fear Museum on a FREE screening of Super Mario Bros. in Raleigh, North Carolina on Friday, September 14th! "In celebration of the 25th anniversary of Super Mario Bros., it seemed like a great time to reflect on the past 7 years since my editorial on the original 3 foam rubber stunt Thwomp Stomper Boots that miraculously turned up after being thought destroyed since the film wrapped in 1993." The meticulous restoration work was performed by Tom Spina Designs and can be read about on their site. Be sure to read Blake's retrospective in Part One and Part Two of Survivor Stompers: 25 Years Later! Although overshadowed by Jurassic Park, the production of Super Mario Bros. was similarly game-changing for the burgeoning visual effects industry; it was the first film scanned and recorded by Kodak Cineon and the first to use Gary Tregaskis' Flame compositing software prior to widespread industry release. Visual effects journalist Ian Failes of vfxblog has interviewed several VFX artists from Super Mario Bros. for the film's 25th anniversary, including visual effects designer and supervisor Chris Woods, digital animator/compositor Sheena Duggal and software developer/animator Kevin Bjorke! Today marks the fifth anniversary of fan film Papercut 2: Mushroom Madness, by director and screenwriter Bryan Sanders of Studio Sandman! Papercut 2, released in 2013, was an independently produced action/adventure film about video games and pop culture. The Mushroom Madness segment starred Jake Smith & Clint Cloys as Mario & Luigi and Kristine Renee Farley as Princess Daisy. Mojo Nixon himself reprised his role as Toad in a voiced cameo, and Farley wore an original screen-used version of the "Meteorite Necklace" prop. "Looking back on all this, I'm very humbled and appreciative of the support I've gotten over the years and for the projects I've worked on. For the people who have worked with me, for me, alongside me... thanks for everything!" We're so grateful to have such a passionate and talented community of fans so invested in celebrating the film. It's been an incredible 25th anniversary and there's still more to come! We're proud to present in association with Video Bob Productions an animated short film "Hoskins in Mario World" for the 25th anniversary of Super Mario Bros.! Artist and animator Cullen McLane fully developed and realized "Hoskins in Mario World" after talks beginning last year with our site editor Steven Applebaum. McLane had previously worked on another parody animation "The Saga of Video Bob" inspired by Super Mario Bros. as a student film, which precursored our wonderful collaboration above. Hosts Adam, Jeramy and returning guest Colin of the SequelQuest Podcast discuss Super Mario Bros. for its 25th anniversary in their 79th episode and each pitch their vision for a continuation! Additionally, our very own site founder/webmaster Ryan Hoss and site editor Steven Applebaum joined Adam in a special bonus episode to talk about our site, the film's legacy, and our own sequel comic! In this brand-new guest editorial, writer and cartoonist John Leavitt discusses the political themes and subtext of Super Mario Bros. and how they relate both to American history and the contemporary American political climate. Be sure to also check out Mr. Leavitt's other work via LeavittAlone.Com as well as our other Editorials. Happy 25th anniversary and, as always, Trust the Fungus! Last February we shared Pokémon Millennium article "Super Mario fa ritorno sul grande schermo dal lontano 1993: il nuovo film sarà davvero un successo?" by Italian pop culture writer Valeria Girardi. We enjoyed it so much we contacted Girardi to request a 25th anniversary feature! Girardi was happy to oblige, penning exclusively for our site "What Do Italian Fans Think of the Super Mario Bros. Movie?" as an expansive look at the film's Italian reception. The Italian release is notable for removing entirely the final two scenes, replacing the original credits with an all-new montage sequence set to Joe Satriani's Speed of Light rather than Roxette's Almost Unreal, and excising the post-credits stinger with Iggy & Spike. Be sure to also check out our other Editorials and happy 25th anniversary! Way back in January of 2013 French pop culture writer Jérémy Beaujoin wrote "John Carter / Super Mario Bros . Une étude comparative." for blog Hushed Conversation. The piece discussed and compared the oft-maligned 2012 and 1993 Disney science-fiction/fantasy adventure films. We have received permission from Mr. Beaujoin to republish this article in English for the film's 25th anniversary. Though not an especially positive look at Super Mario Bros., the article by Mr. Beaujoin nonetheless offers incredible critical analysis we feel should be made available to English-speaking fans. Check it out HERE. Be sure to also check out our other Editorials and always remember: Trust the Fungus! The 25th Anniversary of Super Mario Bros. was an incredible thing to witness! We saw so many fans and curious folks alike discussing the film on social media and using our #SMB25 hashtag. Remember, it's still perfectly okay to continue to celebrate the anniversary for the rest of the year. We sure will! As expected, there were lots of great articles, videos, and social media posts created to reflect on the anniversary! Overall, it was a incredible milestone to witness firsthand. The legacy of Super Mario Bros. will continue to be defined over the years, and we'll be here every step of the way. The best is yet to come. Trust the Fungus! "For all the dinosaur knowledge"-- Minute 105 of the Super Mario Bros. Minute is now available for download! Just in time for the 25th Anniversary of the film, Site founder/webmaster Ryan Hoss and site editor Steven Applebaum return as guest contributors for the last episode of the Super Mario Bros. Minute! Ryan, Steven, Andrew, and Emily come together one final time to celebrate the film and to discuss the SMB Archive's plans to continue its cult legacy into the 30th Anniversary. Additionally, Patreon donors Sydney, Drew, and Daniel appear to reminisce in the podcast's incredible run of 105 minutes. It's been such a privilege and an honor to share the film with Andrew and Emily over the last year. We're truly gracious to have met them, becoming good friends over our shared love of the film. We wish them the best in their future endeavors! Trust the Fungus! Although the main podcast is now over, the Patreon exclusive content will continue for e few more weeks until all episodes of Adventures of Super Mario Bros. 3 are covered, so it's still a great time to donate to the show! Today--May 28, 2018--marks the 25th Anniversary of Super Mario Bros.--the very first feature film adaptation of a video game. To celebrate, we'd like to--of course--watch the film, and get everyone involved! We will begin a live-tweet & watch of the film at 8 PM ET via both the @smbmovie and @smb_ryan Twitter accounts. Use the hashtag #SMB25 so we can see your responses and retweet them! Other sites are already taking note of this historic occasion; if you're a fan of the IMDb, you may have noticed that the film is featured on their front page along with a new video retrospective. Check it out HERE. If you're a newcomer to the site--welcome! If you're a longtime fan of the site, you may notice a *lot* of new updates from the backlog that are now nicely archived on this page. And it doesn't stop here--we're looking forward to continuing the SMB Archive into the 30th Anniversary and beyond! Trust the fungus! Live in Glasgow, United Kingdom? Don't miss a screening of Super Mario Bros. TONIGHT from 7:30PM - 10PM! The Southside Film Festival​ (in association with the Glasgow University Bad Movie Society) is screening the film as part of the 2018 Southside Fringe Glasgow. Long-running podcast The Projection Booth​ has interviewed famed Production Designer and Art Director David L. Snyder​ on his decades-long, industry-spanning Hollywood career! A selection of films with Snyder's involvement include Blade Runner, Pee-wee's Big Adventure, Bill & Ted's Bogus Journey, and our very own Super Mario Bros.: The Movie! This episode focuses on Demolition Man, which Snyder worked on as Production Designer. The 1993 science-fiction classic has often been considered a spiritual companion to Super Mario Bros.
Also check out Mr. Snyder's website for his full filmography or to request an interview on his work on Super Mario Bros. or other cult films! There will be a 25th anniversary screening of Super Mario Bros.: The Movie in Glasgow, Scotland, United Kingdom on Wednesday, May 16th! This event will be hosted by the Southside Film Festival​ (in association with the Glasgow University Bad Movie Society) from 7:30PM - 10PM as part of the 2018 Southside Fringe Glasgow​! For more information, visit the event page via What's On Glasgow. Co-hosts Andrew and Emily of the Super Mario Bros. Minute Podcast traveled to our Modesto, California screening on Saturday, April 28th and recorded a special bonus episode! Our editor Steven Applebaum is a native of the Modesto area, so he personally hosted the event. It was an absolute pleasure to finally meet Andrew and Emily in person. There's nothing quite like friends coming together to enjoy Super Mario Bros. on the silver screen! Additionally, if the podcast's Patreon goal of $25/month is met they'll record a special episode discussing the first chapter of very own pseudo-canon sequel webcomic! Our 25th anniversary screening event Saturday 28th, April 2018 at The State Theatre​ in Modesto, CA was an absolute blast! We have uploaded photos of our performers, decor, and the wonderful audience that shared the film with us to a gallery on our official SMB Movie Archive Facebook page. Please check it out HERE! Thank you very much to the Theatre and their staff. We hope to work together again! 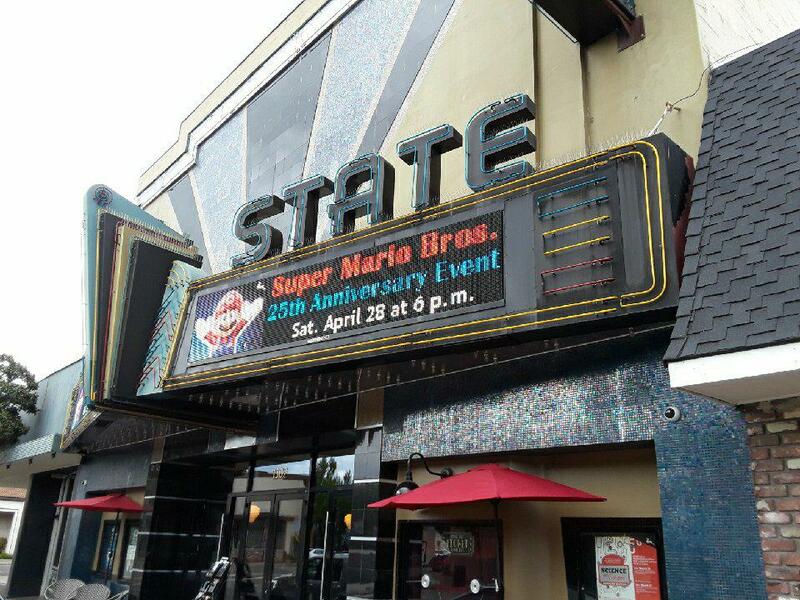 Don't forget to join us TONIGHT in Modesto, California at The State Theatre from 6PM to 9PM for a special, all-ages 25th anniversary event of Super Mario Bros.: The Movie! The event will feature costumed performers, audience engagement games, face-painting, dinosaur concession snacks, a costume contest, and even prizes! Admission: $12 for adults; $8 for kids 12 and under. For more information, check out the event page on Facebook HERE. 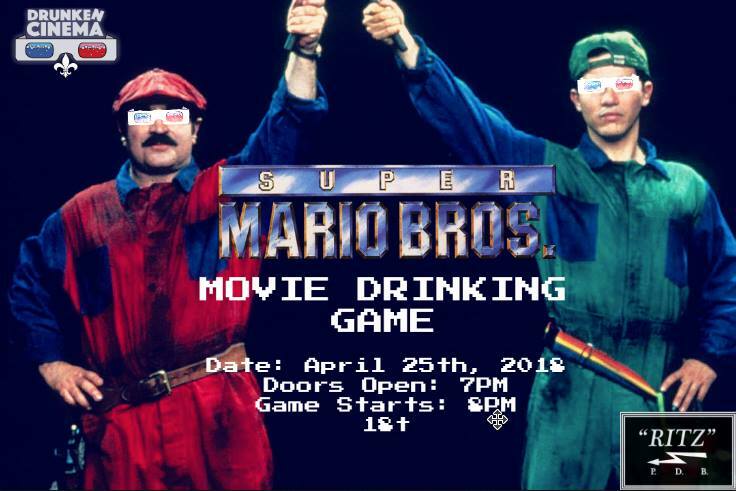 Don't forget to join us TONIGHT in Montreal, Quebec for an 18+ screening event at the Bar le Ritz PDB for the 25th anniversary of Super Mario Bros.: The Movie! Doors open at 7PM. Film starts at 8PM, lasting until 10PM. Tickets are $7 -- this includes "cards and props." Did you know that Super Mario Bros. has been referenced within several official Japanese manga? Videogame fan, pixel artist, and project translator MiloScat has compiled and translated various examples for the first time! Sources used were two 4koma gag strips, an excerpt from Yukio Sawada's Super Mario-kun, and several sections from Kazuki Motoyama's KC Deluxe Mario manga run. Check it out, and be sure to extend your appreciation for the incredible archival work done by MiloScat! Redbull Japan did a retrospective of Super Mario Bros.: The Movie for our recent 25th anniversary Japanese Blu-Ray release! Actors Cheech Marin and Tommy Chong sat down for a career-spanning interview with Forbes. Upon the topic of missed roles and projects, Cheech Marin states he was considered for the role of Mario in Super Mario Bros. Marin states he turned down the role. It is not clear whether Marin was considered for the original fantasy development of Super Mario Bros. or the later Morton & Jankel-helmed production. 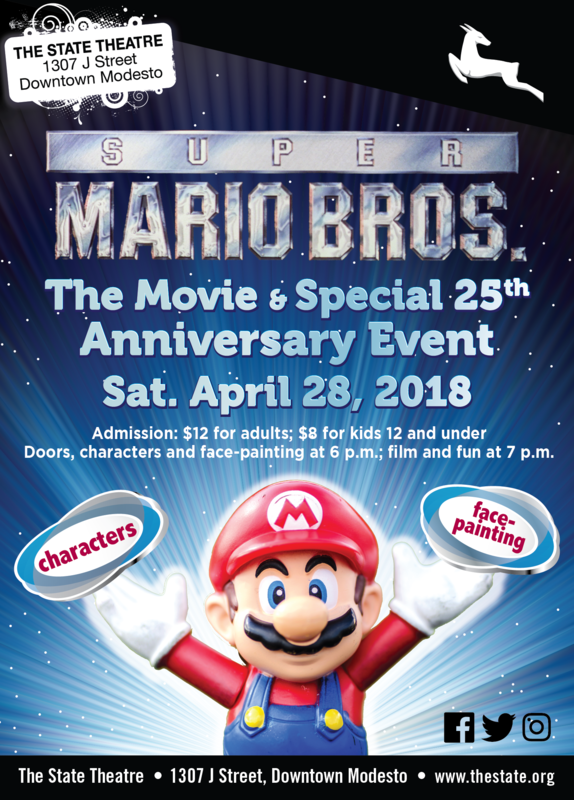 We are proud to host an all-ages 25th Anniversary screening event for Super Mario Bros.: The Movie at The State Theatre​ in Modesto, California on Saturday, April 28th! Admission: $12 for adults; $8 for kids 12 and under. Doors, characters, and face-painting begin at 6PM; film and fun starts at 7PM. We hope to see you there! Trust the Fungus! "Scapenemies"--Minute 90 of the Super Mario Bros. Minute is now available for download! Site editor Steven Applebaum joins Andrew and Emily in this episode as a guest contributor, discussing Lena's fossilized skeleton and last-minute VFX done for the climactic inter-dimensional merge! "Fins v Hair"--Minute 89 of the Super Mario Bros. Minute is now available for download! 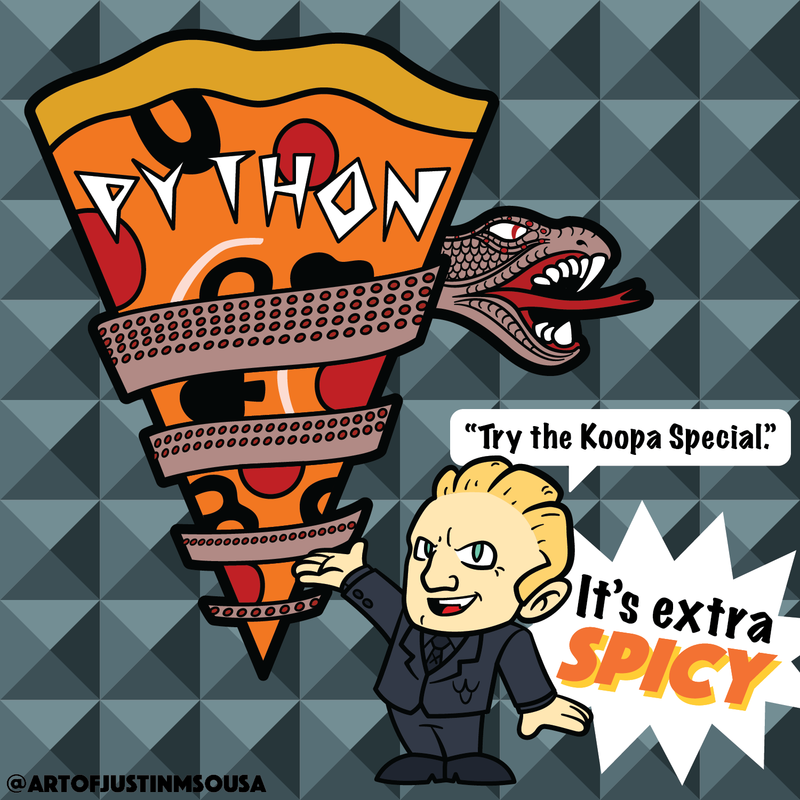 Site editor Steven Applebaum joins Andrew and Emily in this episode as a guest contributor, discussing the structure of Koopa's head-ridges and the sentience of the Bob-Omb! We are excited to announce a 25th anniversary screening of Super Mario Bros.: The Movie in Montreal, Quebec on April 25th! This event will be hosted by Drunken Cinema MTL at 179 Rue Jean-Talon-Ouest, Montreal, Quebec H2R 2X2 at the Bar Le Ritz PDB. Doors open at 7PM, while the screening begins at 8PM. Tickets are $7 at the door ("includes cards and props") and you must be 18 or older to attend. Special thanks to David Oxford of Canadian website Mario's Hat for covering the event in his Montreal Mario Movie Madness article. The A.V. Club via AV News covered our feature with the Guardian, 'The stench of it stays with everybody': inside the Super Mario Bros movie! Anecdotes about the ever-wonderful Bob Hoskins (Mario) are shared from Samantha Mathis (Daisy) and Richard Edson (Spike), including the revelation that the elder plumber partook in marijuana after the day's shoot! The A.V. Club has long promoted the film and our work. We're extremely grateful for their continued support and hope to have more information to share soon for this year's ongoing 25th anniversary! Looks like our interview with the Guardian is making some waves! GoNintendo has picked up the story, focusing on the "Drain Main" treatment that preceded the fantasy screenplay. The "Drain Man" treatment is so-named as it was written by Barry Morrow, Academy Award-winning writer of 1988's Rain Main, and because it apparently followed a very similar narrative that featured older brother Mario caring for savant Luigi while on an existential roadtrip. We do not have this treatment, but would be very interested in acquiring a copy. Please reach us via our Contact page if you have any information! The Archive was interviewed yet again, this time by Keith Stuart of the Guardian! Despite the disparaging title, 'The stench of it stays with everybody': inside the Super Mario Bros movie provides one of the best and most intimate retellings of the film's fabled troubled production. Samantha Mathis (Daisy), Richard Edson (Spike), and Ed Solomon ("Disney" screenplay writer) are newly interviewed for the piece, offering never-before-heard anecdotes. The piece also finally corrects the longstanding misconception that Tom Hanks was considered for the role of Mario when it was actually Luigi! Finally, site founder Ryan Hoss and editor Steven Applebaum discuss the film's connection to Tim Burton's Batman and also provide an update on the ongoing 4K restoration efforts. This is a must-read for any fan of the film and its continually evolving cult legacy! "I had storyboarded the entire film from beginning to end from the original scripts," Rocky Morton tells me. "And when the new script came in it didn't match any of my storyboards. I remember ceremoniously burning them in a car park and saying 'okay now we're flying from the seat of our pants.'" 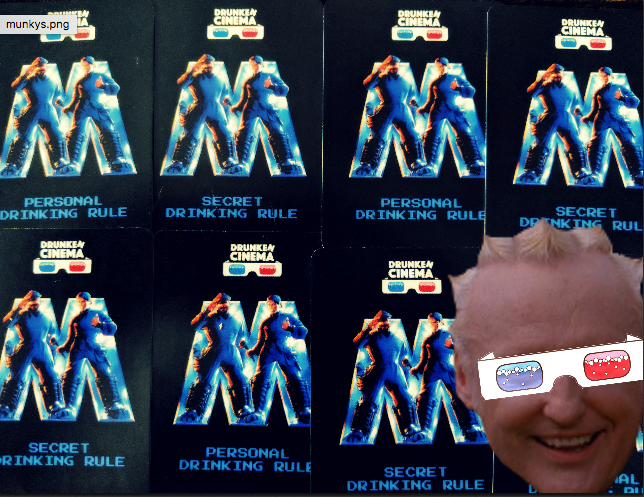 Although Morton and Jankel, best known for their work on the 1980s TV film Max Headroom, were [undoubtedly] victims of studio interference, Morton himself-–who has since "healed" from his harrowing Super Mario Bros. experience–-doesn't believe that that's the main problem with adaptations. "Video games just aren't movies," he says. "That's the biggest challenge. You're shoehorning something, you're trying to fit a square peg into a round hole. You have to come up with a clever take on it that oils the wheels of storytelling. You have to be inspired by the video game and then make something that's true to the movie genre." The Heavy Anchor​ in St. Louis, Missouri will be holding a FREE screening of Super Mario Bros. this Tuesday, March 27th! Doors open at 8PM, while the screening itself will be from 9PM to 12AM. The Heavy Anchor is a comedy club venue, so note there will be live heckling/riffing from Shut Up During the Movie! hosts Kennard Williams, Jesslyn Vezeau-Shipp, and Brandon Judd. Writer Valeria Girardi of Italian website Pokemon Millennium wrote a wonderful article discussing the upcoming animated adaptation of Super Mario Bros. by Illumination Studios as well as our own work towards celebrating the 1993 original! We've reached out to Girardi for a feature on the Italian release of the film and how Italian fans feel about it, so be sure to visit again soon! Spanish pop culture site REVISTA CINEMANIA covered our recent Kotaku interview! It's truly amazing how much popular opinion towards the film has changed over the last 25 years, going from ridiculed and dismissed to cherished cult classic. This shift in perception would not be possible without the preservation efforts of this Archive, so we're incredibly proud and grateful to have our work recognized in a new piece by Luke Winkie of Kotaku. The article, "Two Fans' Obsessive Quest To Redeem The Super Mario Bros. Movie," delves into the breadth of our site's materials, covering everything from the draft screenplays to deleted scenes to props and costumes. We also formally announced our 4K restoration! Be sure to give it a read HERE and be sure to look forward to more 25th anniversary interviews and retrospectives. As always, trust the Fungus! The legendarily harrowing development of the Super Mario Bros. film can be as fascinating as the cinematic experience itself, so we always appreciate a thoughtful retelling. For a brief, yet well-written version of the story, we recommend this recent blog post by B&S About Movies. B&S then reached out to interview our site editor Steven Applebaum about the Super Mario Bros. games, the 1993 live-action film, how he joined us at the Archive, and finally his general interests outside of our cult community. We hope you enjoy getting to know him! Pop culture and entertainment website NowThis Nerd has debuted a new video feature with host Andrew Rivera on the film's development and production--Super Mario Bros.: The Disastrous Debut of Video Game Movies. Although Rivera asserts the film has a negative reputation, it's overall an informative and well-produced feature that's definitely worth watching. It even discusses our very own pseudo-sequel comic! "Solo Soprano"--Minute 68 of the Super Mario Bros. Minute is now available for download! Site founder and webmaster Ryan Hoss returns as guest contributor for another episode of the Super Mario Bros. Minute! Ryan, Andrew, and Emily continue where they left off in Minute 67, "In geniously," to speculate just why President Koopa so detests those plumbers! "In geniously"--Minute 67 of the Super Mario Bros. Minute Podcast is now available for download! Site founder and webmaster Ryan Hoss joins Andrew and Emily in this episode as a guest contributor, discussing Mario & Luigi's plumbing heritage, the fan-favorite elevator suit-up scene, and Ryan's personal collection of screen-used memorabilia! Our Japanese, Region 1 release of Super Mario Bros.: Goddess of The Demon World is officially now available for purchase! This release reunited the original Japanese voice actors Kazuhiko Inoue and Shigeru Chiba to dub their characters Iggy and Spike in scenes that had previously been undubbed and never-before-seen in Japan. This means Japanese fans will get to experience a fuller version of the film they may never even knew existed! Please find the Blu-Ray available for import via the TC Entertainment, Inc.website or its listing on Amazon. Nick Clement of We Are Cult had the honor of interviewing famed Production Designer and Art Director David L. Snyder on Blade Runner, Demolition Man, Super Mario Bros.: The Movie, and much more! Check back later this month on December 22nd with details on importing your own copy! "Princess Daisy is the Furiosa of this dimension"--Minute 50 of the Super Mario Bros. Minute Podcast is now available for download! Site editor Steven Applebaum joins Andrew and Emily in this episode as a guest contributor, discussing the alternate Daisy-focused "Disney Cut," Fiona Shaw's efforts to expand Lena's role, and the cut "Family Pride" character development arc. We are excited to announce another successful filmed interview--this time with Princess Daisy herself, actress Samantha Mathis! We look forward to premiering this footage in a new 25th anniversary documentary, to be announced May of 2018! We are proud to announce a new Japanese, Region 1 release of Super Mario Bros.: Goddess of The Demon World! Inside-Games is reporting via the TC Entertainment, Inc. social media account on Twitter is reporting that the film will finally be brought to Japan in the current best possible quality available. This new DVD and Blu-Ray by TC Entertainment, Inc. has licensed our 2014 transfer from the Region 2 release by Second Sight Films. This release will bring back Japanese voice actors Kazuhiko Inoue and Shigeru Chiba to dub their characters Iggy and Spike (respectively) for scenes previously left undubbed. As always, Trust the Fungus, and happy 25th anniversary! Actor John Leguizamo was on "Late Night with Seth Meyers" last weekend to discuss his life and career, including how he turned down a role in Philadelphia to star as Luigi in Super Mario Bros.
Leguizamo had previously shared this anecdote last July in a speech at the Yiddish Theatre's Immigrant Arts Summit. We are excited to announce a successful filmed interview with fan-favorite Bertha actress Francesca P. Roberts! Our very own site editor Steven Applebaum traveled to Los Angeles for the shoot, bringing with him a screen-used pair of Thwomp Stompers. Miss Roberts had not seen them in 25 years! We look forward to premiering this footage in a new 25th anniversary documentary, to be announced in May of 2018! Finally, we're very grateful that longtime site supporter Blake Dumesnil happily lent the Thwomp Stomper boots from his personal collection for this reunion! Our 4K restoration initiative is kicking into high gear! Hot off the heels of our restoration of "The Power" trailer from the Super Mario Bros. movie comes our newest addition to the archive: the "This Ain't No Game" trailer is now available to watch in 4K resolution! This trailer--full of never-before-seen footage--has been released online, presented exclusively by The Super Mario Bros. The Movie Archive website. The original 35mm trailer was in the personal collection of webmaster Ryan Hoss (who commissioned a 4K scan through Raleigh's A/V Geeks), and SMB Archive's Rory Joscelyne performed color and white balance restoration through his Reset Media Productions studio. Much like "The Power" trailer that has been restored previously, "This Ain't No Game" is presented in the "open matte" style, giving fans a look at footage from the film that has never been seen before. For a more detailed description of the whole process (in addition to an imbed of the trailer video itself), check out the full article HERE! "The Power" trailer from the 1993 Super Mario Bros. movie just got a heck of an upgrade. A newly restored 4K scan of the trailer--named after the 1990 Snap! dance track it features--has been released online, presented exclusively by The Super Mario Bros. The Movie Archive website. The original 35mm trailer was acquired by friend of the site Ben Gourlay (who commissioned a 4K scan), and SMB Archive's Rory Joscelyne performed color and white balance restoration through his Reset Media Productions studio. In addition to the 4K clarity, the trailer is presented in the "open matte" style, giving fans a look at footage from the film that has never been seen before. For a more detailed description of the whole process (in addition to an imbed of the trailer video itself), check out the full article HERE! Back in January, I teased some additional content related to the Zavvi-exclusive Super Mario Bros. steelbook release, and now I've finally been able to post exactly what that content is. My apologies for the huge gap in updates there--we're still getting back into the swing of things around here. What we've been able to do is have a chat with artist Paul Shipper, who provided us a revealing look at the creative process involved in the production of his cover art used for the Zavvi Super Mario Bros. steelbook! It's a great read--check it out HERE! And that's not all--we've got another exciting update that we'll post within the next week (but probably sooner). Keep your eyes peeled--a few of our good fans and friends are bringing us something worth its weight in pixels. Co-hosts Andrew and Emily of the Super Mario Bros. Minute Podcast traveled to the Frida on the Roof! screening of Super Mario Bros.: The Movie in Santa Ana, California on Sunday, August 27th and recorded a special bonus episode! Actress Samantha Mathis--our very own Princess Daisy--was interviewed by The Nerd Soapbox at Monsterpalooza 2017! Mathis discusses her role as Dr. Alice Calvert on Under the Dome (an original character for the show), voicing Crysta in FernGully: The Last Rainforest, battling "gross" vampires in Guillermo Del Toro's The Strain, and of course Princess Daisy in Super Mario Bros.
As a testament to the enduring cult legacy of our favorite film, the Super Mario Bros. Minute Podcast has launched! The Super Mario Bros. Minute stands apart from previous podcasts featuring the film by uniquely devoting an episode per minute. Co-hosts Andrew and Emily have a formidable goal: 104 episodes -- each focused on a single minute! If you've just now stumbled upon our website, welcome! There's probably a good reason you've made your way here--the news that the 1993 Super Mario Bros. film will again be re-released on Blu-Ray is quite exciting! Thanks to the fine folks at Zavvi, there will be an exlusive, limited edition steelbook that will be released on February 13, 2017, featuring gorgeous new artwork from Paul Shipper. You can pre-order the Blu-Ray HERE. If you're a returning reader, thanks for stopping by. I apologize for the lack of updates since the Blu-Ray released; it was a gigantic "mission accomplished" moment for us and it seemed like a good time to let that stand for a while. Rest assured, though, there is still an insurmountable amount of content left to go, and we've been quietly working behind the scenes for some great events for the film's 25th anniversary next year. In the meantime, check out our updated YouTube channel, and be on the lookout for some fun content related to this steelbook Blu-Ray release in the near future! If you're wondering where all the old updates went, check out our update archive page.